This tour is so sweet. 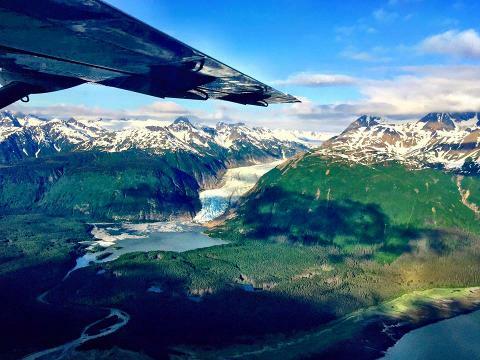 Take off from the downtown Juneau float plane dock and soar up to the Taku Glacier, viewing 5 glaciers along the way. Landing at the Lodge, you can enjoy a stroll or have a drink chilled with glacier ice while you relax and enjoy some luxury wilderness. 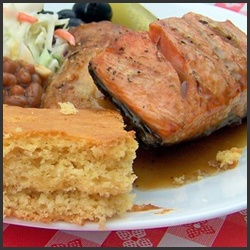 Soon the lunch bell will ring and you'll enjoy probably the freshest salmon you'll ever have. (Fire-grilled chicken is also available for those who prefer poultry). 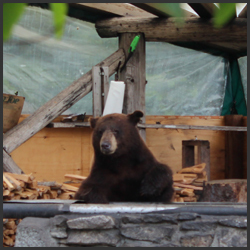 After your meal, there is a very good chance of seeing bear that come by to "clean" the grill, or you can relax in a swinging chair with glacier view, browse the gift ship or take a guided nature walk to the waterfall. You spend a full two hours at the Lodge, so there's plenty of time to do it all. And then there's still more flying to be done with more great views on your way back to Juneau.